Unlike smartphones, we tend to hold onto laptops for several years before considering an upgrade. And for the last few years, it hasn’t made much sense to get a new model if your current machine was getting the job done. But in 2019, it may be time to pull the trigger. New Intel chips are on the horizon, so there is bound to be a slew of new models at some point later this year, but the first crop of 2019 models looks more promising than ever. We’ve been able to go hands-on with most of the top laptops coming later this year (some shipping right now) from Dell, HP, Asus, Razer, Lenovo, LG, Samsung, and more to help you see which ones could be worth investing in this year. Here are the ones we’re most excited about. Lenovo’s laptop lineup for 2019 doesn’t include many drastic differences, at least so far. 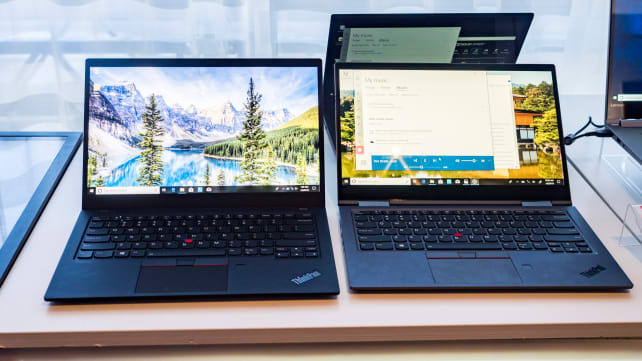 We caught up with the lineup at CES 2019 and the biggest additions are new versions of the ThinkPad X1 Carbon and the Thinkpad X1 Yoga. The X1 Carbon has been one of our favorite business laptops for years, though its appeal is obvious to anyone who just wants a no-nonsense, high-quality machine. It is exceptionally light and durable, with a top-notch 14-inch display and excellent keyboard and trackpad. As the name suggests, it owes its mobility to the carbon fiber design, which is now reflected in the woven pattern on top. Backed by proven 8th-gen Intel Core chips and fully customizable, the X1 Carbon is a great option for everyday users, power users, and those in government, corporations, or hospitals that need a business-class laptop but still prefer thin and light laptops. The X1 Yoga 4 strikes a similar note, but it sticks with a more familiar aluminum body similar to other premium laptops. The Yoga 4’s main appeal is thinner bezels, making for a noticeably smaller footprint overall. It earns the “Yoga” moniker thanks to its 2-in-1 hinge, which gives it phenomenal flexibility no matter how you want to use it. Dell’s XPS 13 is widely considered the best Windows laptop for most people, with a premium design, loads of configuration options, extremely good battery life, and starting prices under $1000. The only flaw in the XPS 13? The razor-thin bezels around the screen meant the webcam was stuck under the screen, resulting in a lot of awkward video chats. That is finally fixed for 2019, with the webcam moved to the top of the nearly bezel-less display, along with some other minor spec bumps. The camera itself still delivers a decent quality picture, even in low light, so there haven’t been many sacrifices there. Further down the lineup is the new Dell Inspiron 7000 2-in-1 Black Edition, a special model that is debuting in 2019. This updated version is in line with the existing Dell Inspiron 7000 2-in-1 lineup, with a premium aluminum design, support for Dell’s Active Pen, and a ton of available configs. The new model sets itself apart with an awesome new hinge design that lets you house the Active Pen right in the hinge. It’s held in place with magnets right below the screen, accessible whether you’re in laptop or tablet mode. It’s great, and is something that I hope Dell brings to the rest of its Inspiron 7000 series before too long. But by far the most radical new model in Dell’s lineup is the Latitude 7400 14-inch 2-in-1. 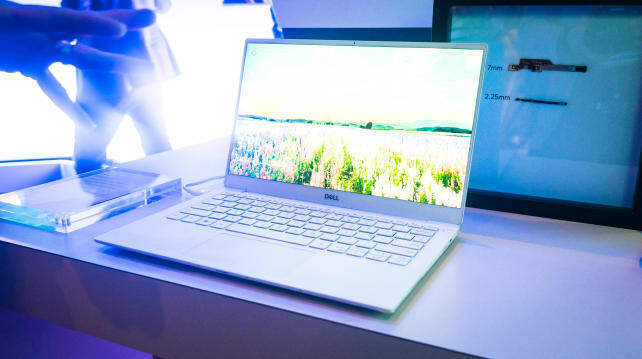 Though “Latitude” is usually code for “boring business laptop” in Dell’s lineup, the new 7400 is a completely rethought premium device, with design language in line with the Dell XPS 13. It has an all-metal design, a nearly bezel-less display, and it’s both thin and incredibly light. And because it’s a business laptop. you’re getting a full complement of new and legacy ports, support for enterprise-level connectivity and security standards, and security features like Windows Hello sign-on via face recognition (which both the new XPS and Inspiron models lack). It even uses a short-field sensor to detect when you’ve walked away from your laptop, locking it automatically. HP hasn’t yet announced a ton of new models for 2019, with many of its top models being updated late last year. 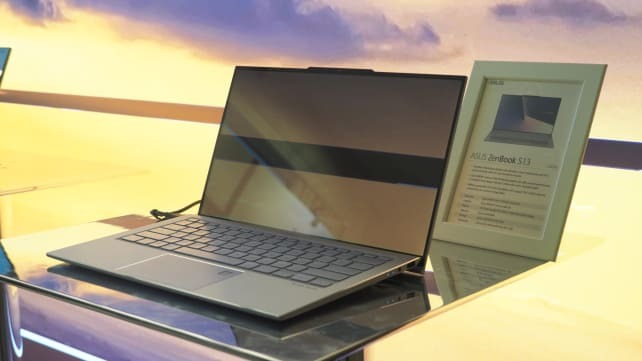 But at CES 2019 we did get to see the new HP Spectre x360 15 with an AMOLED display, taking an already superb premium laptop and giving it a cutting edge display. It’s one of the few AMOLED laptops on the market, and we’re excited to see if it can deliver the same kind of screen performance we expect from AMOLED phones. One new HP laptop that did catch my eye was the x360 G1 Chromebook, which looks very much like one of HP’s premium x360 models but runs Google’s lightweight Chrome OS. It is geared towards business users, offering plenty of ports, a great-looking design, and 12+ hours on a single charge. 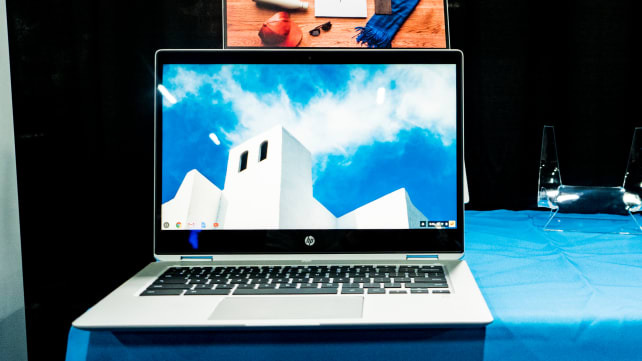 HP also debuted one of the first Chromebooks powered by AMD processors, which is an exciting development by adding some much-needed competition to the space. It remains to be seen how well these new models perform, but with most Chromebooks sticking to the budget end of things, having a cost-conscious chip maker like AMD involved should only help speed up the segment. 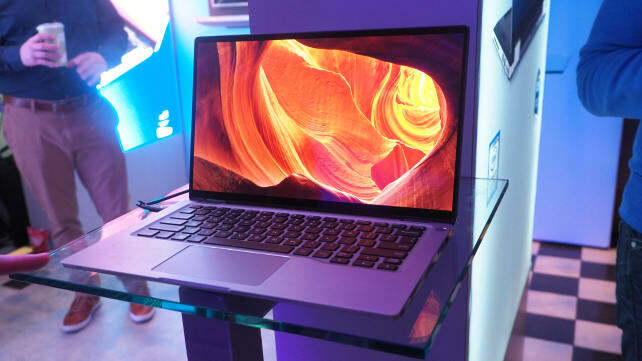 The Asus ZenBook S13 might not be the fastest laptop coming in 2019, but it may already be the best-looking. It features an extremely slim design, a screen with an almost invisible border around it, and a case made from a CNC milled slab of aluminum. It is the kind of laptop that will certainly turn heads, prompting questions from everyone around you about where you got it. The effect is a laptop that is slim, lightweight, extremely portable, but feels remarkably solid. It’s just a beautiful piece of tech that is also wonderfully functional. 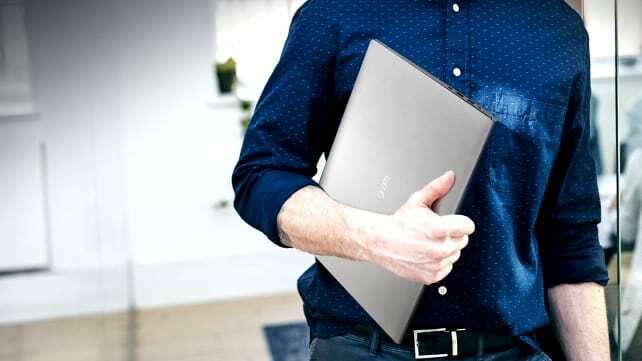 One of our favorite features (and something also found on the similar but slightly less-advanced ZenBook (without the S) is a hinge that gently lifts the keyboard when you open the screen. It raises the keyboard ever so slightly, creating a more natural typing position. It’s a user-centric piece of design that we’ve seen on a few other laptops and hope to see more of in 2019. On the other end of the spectrum is Asus’s newest Chromebook Flip, the Flip C434. Following in the footsteps of one of the most popular Chromebooks on the market, the Flip 434 also features a beautiful all-metal aluminum design, an excellent screen, and a full complement of ports. It runs the lightwight Chrome OS (as do all Chromebooks), but it’s far from the budget student laptops that make up the rest of the Chromebook ecosystem. 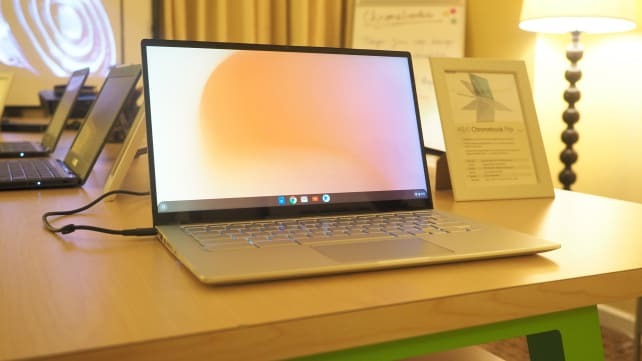 Instead, it’s one of the nicest laptops we got a chance to try at CES 2019, making a strong case that Chrome OS laptops deserve to be considered alongside Windows and Mac machines—no matter what price point you’re shopping in. Not known for its prowess when it comes to laptops, LG nevertheless continues to plug away with its lightweight Gram series. Well, it may finally have a hit on its hands with the LG Gram 17, a 17-inch laptop that weighs in at just 3 lbs but seems to make very few compromises to get there. To put that weight into perspective, it’s about the same weight as a MacBook Pro with Touchbar—a 13-inch MacBook Pro with Touchbar. Though the Gram 17 doesn’t have the same premium (read: all-metal) design of other high-end machines, that’s obviously due to its extremely low weight. If you think modern laptop screens are just way too small, the Gram 17 is worth a serious look.